Actually, i was searching for long to replace the beef recipes in our diet. Though beef recipes taste awesome with its unique taste and flavor, high consumption of beef is considered as unhealthy because of its high-fat content and high level of cholesterol. Finally here is the good replacement for beef. Camel meat / ottaka irachi has two good qualities which distinguish it from beef and mutton. It's low fat and high moisture content makes this meat more popular. More over camel meat also contains a high ratio of good quality of protein. 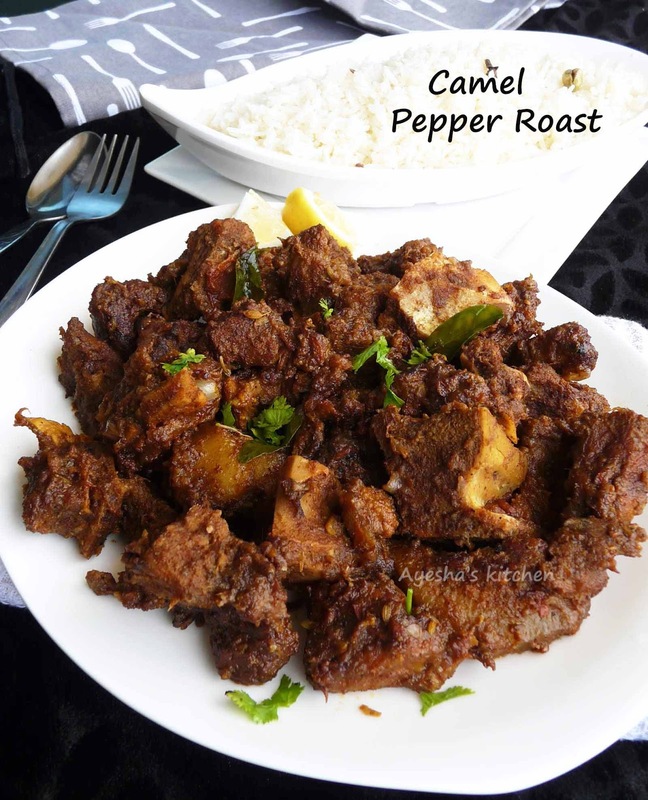 Camel meat is also a good source of many vitamins especially vitamin B complex and important minerals. And the most important of all is that camel meat is characterized by low level of cholesterol as compared to beef and that makes this meat a healthy food for humans. Camel meat, when compared to beef, is rich in amino acids that are necessary to humans. It has same taste like beef but its meat fat is less than beef. So when considering the human health, nutritional value of camel meat is much better than other animals. So its consumption is healthy and recommended for weight loss. It prevents obesity and heart diseases. 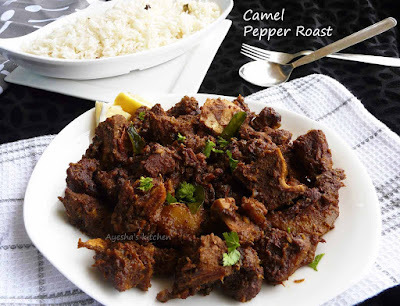 So let's move on to the recipe for camel pepper roast which tastes irresistible. 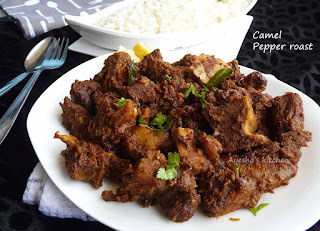 Clean the camel meat well and make medium sized pieces. Set aside to drain excess water. Heat a pressure cooker with oil (preferably coconut oil). Once hot, add sliced onion and saute until light and soft. To this, add garlic chopped and saute well until raw smell goes off. Then add tomato and cook for a while. To this add the cleaned drained camel meat and give a fine mix. Now add turmeric powder, chili powder, coriander powder and pepper powder(2 tsp). Stir very well. Add fennel seeds, fenugreek seeds, and salt. Wait until the pressure releases and then open the lid. Heat a pan with oil and fry chopped shallots, curry leaves, and coriander leaves for a while. To this add the cooked camel meat. Cook over a medium flame until the gravy becomes thick and each piece of meat is well coated with the gravy (it might take around 20 minutes or more over a medium flame for a dry gravy consistency). Finally, add 1 tbsp of pepper powder (this gives a peppery flavor to the dish). Stir occasionally (very important). Check for salt. Garnish with chopped coriander leaves and serve hot along with ghee rice, paratha or chapati.